Manchester United advanced to the round-of-16 of the Europa League on Thursday night with a 1-0 win at St Etienne, going through 4-0 on aggregate. 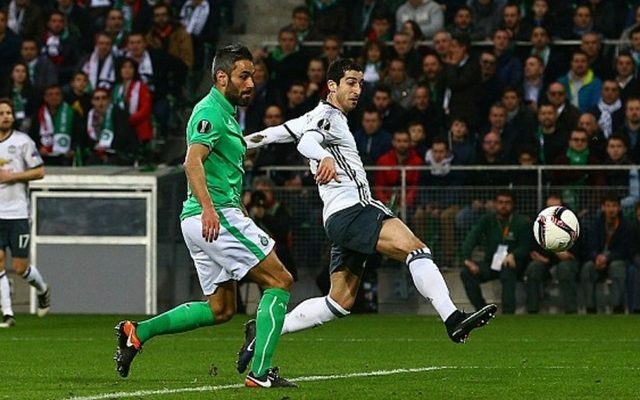 Henrikh Mkhitaryan scored the only goal of the night as the visitors took an early lead and left their opponents with a mountain to climb thereafter. While both sides had their chances to score, neither were able to get on the mark as United extended their stunning run to just one defeat in their last 25 games in all competitions. The night was soured by Eric Bailly’s sending off after two bookable offences, while Mkhitaryan was forced off with an injury concern shortly after his goal. In turn, Jose Mourinho will have a few headaches moving forward, especially in the short-term with the EFL Cup final with Southampton fast approaching. Nevertheless, after selecting a strong side for the game, both he and his players got their reward, albeit without the most convincing of displays, as they advance in the Europa League and march on in search of silverware. It was a frustrating night for Zlatan Ibrahimovic as he was jeered with every touch of the ball, but while the Swede will be disappointed with his efforts, it was a struggle in general for United from an attacking perspective although it will matter little given that they got the job done. Manchester United player ratings: Romero 7; Young 7, Bailly 5, Smalling 6, Blind 7; Fellaini 6, Carrick 7, Pogba 7; Mata 7, Ibrahimovic 6, Mkhitaryan 7. Substitutes: Rashford 6, Schweinsteiger 6, Rojo 6.